She sometimes talks to rainbows, and the applause of the crowd gives her orgasms. She might be the most definitive Leo of the Girl Group era; so we celebrate Ronnie Spector on her 72nd Birthday. The fierce feline from Spanish Harlem whose roar hasn’t stopped after 55 years of performing comes with a legacy complex and rich. She stands as one of the true survivors of the Rock & Roll era. One of the most troublesome parts of that legacy was being crowned Queen of the Wall Of Sound based on the intermingling of her talents and passions with Phil Spector. 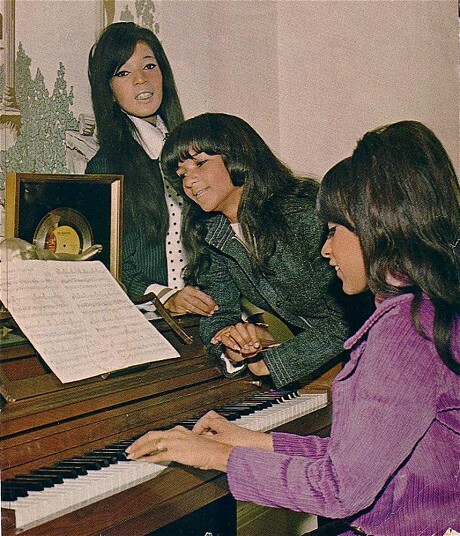 In actuality, The Ronettes track record of huge hits is a lot smaller than label mates The Crystals, or a number of their Girl Group contemporaries. But the influence is huge, and some of the most debated commercial works in Spector’s repertoire are Ronettes singles. The influence was huge, but time was rapidly passing Phil, and by default, Ronnie, aside. When all started going south, the control of Spector over new wife Ronnie first meant pulling Ronnie off the road from touring with her relatives in the Ronettes, and far more diminished times in the Studio. It was to the point that her sister Estelle went on to record her own solo single in 1967. One of the easing of the vice grips on Ronnie’s life lead to this one off single while Phil was experiencing a revival of sorts with the success of “Black Pearl” by Sonny Charles and The Checkmates. This ebullient number brings back the best of the romantic singles Ronnie had led 4-5 years previous, and seemed destined to do a bit of something. I’m none too sure of the specifics of why it went nowhere, but it was the last bright light of The Ronettes to see the Billboard Hot 100.